With four revenue streams including government consulting, Proviasette,™ Store-A-Tooth™ and additional processing and storage services to be launched in the near future, Grace Century is confident that Provia Labs will position itself as the premier private biobank in the world. Dental Stem Cell Banking Services, Biobanking Products, and Biobanking Advisory Services. ...we are confident that Provia will position itself as the premier private biobank in the world. Grace Century’s dental stem cell and biobanking project, Provia Laboratories, expects C-Class private placement activities to complete in the second quarter of 2014, thus insuring adequate funding for their next phase of expansion. Grace Century has arranged a $3MM tranche with one investor within its group, which will come close to completing their C-round. Additionally, there are two institutional groups aggressively completing their due diligence which would satisfy the future capital needs for Provia for 2015 and beyond. ”Provia is ready to expand into Europe, as their Provia laboratories Europe, LTD. was recently formed in the UK in January, and marketing alliances abroad are being formed. Together, with its partnerships in Singapore and Latin America, as well as its plans to build a new cell manufacturing and storage facility in the Caribbean in early 2015; you have a true global player,” Wolf concluded. Grace Century, FZ LLC is an International research and private equity consultancy located in Ras Al Khaimah, (north of Dubai) in the United Arab Emirates (UAE). Grace Century specializes in “game-changing” life science and health related private equity projects. For further information, visit: http://www.gracecentury.com. 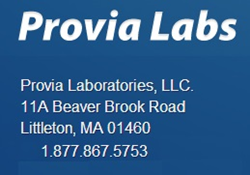 Headquartered in Littleton, MA, Provia Laboratories, LLC is a healthcare services company specializing in high-quality bio-banking (the collection, transport, processing and cryogenic storage of biological specimens). Provia Labs offers the Proviasette™ product range for use in bio-banking environments to improve sample logistics, security and quality. The company manages and promotes its own bio-bank for a dental stem cell banking service, Store-A-Tooth™, which gives families the option to store stem cells to protect their children’s future health and take advantage of advances in stem cell therapies. Provia Labs advises industrial, academic and governmental clients on matters related to the preservation of biological specimens for research and clinical use. Provia Labs is a member of ISBER, the International Society for Biological and Environmental Repositories, as well as ESBB, the European, Middle Eastern & African Society for Bio-preservation & Biobanking. For further information about Proviasette™, contact Provia Labs +1 (781) 652-4815 or visit http://www.proviasette.com.